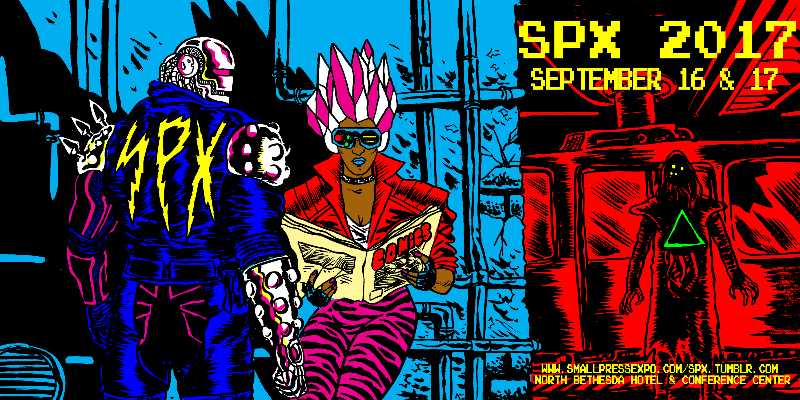 Media Release – Small Press Expo is proud to announce its first slate of Special Guests for SPX 2017. The festival takes place on Saturday and Sunday, September 16-17, at the Bethesda North Marriott Hotel & Conference Center and will have over 650 creators, 280 exhibitor tables and 22 programming slots to entertain, enlighten and introduce attendees to the amazing world of independent and small press comics. JILLIAN TAMAKI is an illustrator and cartoonist based in Toronto. She is the co-creator along with her cousin Mariko Tamaki of the graphic novel Skim, a New York Times Best Illustrated Book and a finalist for the Governor General’s Award. Their second graphic novel This One Summer earned a Governor General’s Award and a Caldecott Honor. Tamaki’s first collection of her own comics was the critically acclaimed New York Times bestseller and Eisner Award-winning SuperMutant Magic Academy. Jillian will be at SPX to sign her latest book, Boundless. ELEANOR DAVIS is a cartoonist and illustrator living in Athens, GA. In 2009, Davis won the Eisner Award’s Russ Manning Most Promising Newcomer Award and was also named one of Print magazine’s New Visual Artists. In 2013, her short story In Our Eden received a gold medal from the Society of Illustrators. In 2015, her book How To Be Happy won the Ignatz Award for Outstanding Anthology or Collection. Her latest book from Koyama Press is You & A Bike & A Road. EMIL FERRIS will be making a rare East Coast appearance in support of her debut graphic novel, My Favorite Thing Is Monsters from Fantagraphics, that has taken the reading world by storm. The richly textured story follows a young girl obsessed with monsters, as she investigates the murder of her neighbor. Along the way the book explores politics, art, history, race, family and more in one of the most original and rewarding graphic novels. Emil has an MFA from the Art Institute of Chicago and in 2010, Ferris was made a Toby Devan Lewis Fellow in the Visual Arts. TILLIE WALDEN is a two-time Ignatz Award–winning cartoonist from Austin, Texas. Born in 1996, she is a recent graduate from the Center for Cartoon Studies, a comics school in Vermont. Her comics include The End of Summer and I Love This Part, an Eisner Award nominee. Spinning, her autobiographical graphic novel about her days as a competitive ice skater, will debut at SPX. ANN TELNAES creates editorial cartoons in various mediums- animation, visual essays, live sketches, and traditional print- for the Washington Post. She is the 2016 recipient of the National Cartoonists Society Reuben for Outstanding Cartoonist of the Year and won the Pulitzer winner for editorial cartooning in 2001. Ann has an upcoming book “Trump’s ABC” with Fantagraphics publishing and her images, which are licensed by Cartoonist Group Licensing, may be found on merchandise at Amazon.com. HANNAH K. LEE resides in Brooklyn, where she works as a commercial illustrator, letterer, and designer and is a regular self-publisher of zines and art books, which contain personal work and experiments in letterforms and production. She was born to Korean immigrants and raised in the suburbs of Los Angeles, CA. She received a BFA in illustration at Parsons School of Design. Here first book, Language Barrier from Koyama Press, will debut at SPX. MATT WUERKER is the staff cartoonist for POLITICO.COM, providing editorial cartoons, illustrations, caricatures and Web animations for both the print and Web platforms of the publication. Matt won the Pulitzer Prize for Editorial Cartooning in 2012. In 2010 he was awarded the Herblock Prize at the Library of Congress and later that year won the National Press Foundation’s Berryman Award. MICHAEL DEFORGE: Michael DeForge was born in 1987 and grew up in Ottawa, Ontario. His one-person anthology series Lose has been nominated for, or won, every major comics award including the Ignatz and Eisner awards. His previous graphic novels with Drawn & Quarterly are Ant Colony, Big Kids, and First Year Healthy. His most recent book is Sticks Angelica, Folk Hero. Photo courtesy Mathew James-Wilson. ETHAN RILLY is a cartoonist and illustrator from Toronto. His one-man anthology comic series Pope Hats, from AdHouse Books, has received Doug Wright, Ignatz, and Joe Shuster awards as well as Eisner award nominations. He has illustrated for Slate, HarperCollins, Complex, Wired, Chronicle Books, The Walrus and The Believer. His latest is the long-awaited Pope Hats #5. Ethan now lives in Montreal with his wife and brown dog. SHANNON WHEELER is an award-winning cartoonist best known as the creator of the satirical superhero Too Much Coffee Man. He has also created the strip Postage Stamp Funnies for The Onion and frequently contributes cartoons to The New Yorker. With writer Mark Russell, he co-created the acclaimed book God Is Disappointed in You (a tongue-in-cheek retelling of the Bible) and its sequel Apocrypha Now. In his latest book from Top Shelf, Sh*t My President Says: The Illustrated Tweets of Donald J. Trump, Wheeler tackles the 140-character president. ALEXIS ZIRITT is originally from Venezuela but has lived in Florida for the past decade. He’s been published in Complex Magazine, Heavy Metal, BOOM! Studios, Image Comics, Black Mask Studios, Adhouse Books and Dark Horse Comics among others. He is the Co-Creator of Space Riders and Tarantula, from Adhouse Books. CHRIS KIM is a graduate of OCAD University in Toronto, his clients include The New York Times and The Hollywood Reporter, among others. He regularly posts illustrations and short stories at chriswkim.com. His first graphic novel, Herman by Trade, is published by SelfMadeHero and will be available at SPX 2017. In the next few weeks, SPX will announce additional guests, special events, the 2017 Ignatz nominees and a full slate of programming. Small Press Expo (SPX) is the preeminent showcase for the exhibition of independent comics, graphic novels, and alternative political cartoons. SPX is a registered 501(c)3 nonprofit that brings together more than 650 artists and publishers to meet their readers, booksellers, and distributors each year. Graphic novels, mini comics, and alternative comics will all be on display and for sale by their authors and illustrators. The expo includes a series of panel discussions and interviews with this year’s guests. The Ignatz Award is a festival prize held every year at SPX recognizing outstanding achievement in comics and cartooning, with the winners chosen by attendees at the show. As in previous years, profits from the SPX will go to support the SPX Graphic Novel Gift Program, which funds graphic novel purchases for public and academic libraries, as well as the Comic Book Legal Defense Fund (CBLDF), which protects the First Amendment rights of comic book readers and professionals. For more information on the CBLDF, visit their website athttp://www.cbldf.org. For more information on the Small Press Expo, please visit http://www.smallpressexpo.com.